RS Newswire Dec 16, 2004. Blind Lagoon, Louisiana. Blinded By The Light Laser Center (BBTLLC) of Louisiana is pleased to announce the arrival of the latest generation in laser correction. This new technology will soon be available at the doorstep of anyone living in the continental United States. Blinded By The Light ushers in a new era in refractive surgery with its first-of-a-kind mobile service. Prospective patients who are fearful of the risk of driving to and from a LASIK clinic will soon be able to have LASIK surgery performed in the comfort of their own driveway. Dr. Mark OvZorro, affectionately known as Zorro by his patients and plaintiffs, is the medical director of BBTLLC and to date has performed over twenty LASIK procedures in various third world countries. Dr. Ovzorro, working closely with his esteemed colleague, Dr. Ima Butcher, has developed OpaqCor(tm), a unique form of LASIK that attempts to eliminate all of the optical aberrations found in the natural eye. Dr. Mark OvZorro and his medical staff will be touring the country in a fully equipped mobile surgical trailer. Get ready to throw away your glasses and contact lenses and experience "Low Definition Vision (tm)", or LDV as it is rapidly becoming known as in the refractive surgery industry. The primary goal of the OpaqCor(tm) procedure is to prevent light from entering the eye by creating a completely opaque cornea. The OpaqCor(tm) procedure starts with a special macrokeratome developed by Dr. OvZorro. A MegaThick (MT(tm)) 400 micron deep flap is cut, completely severing the corneal nerves and irreversibly weakening the cornea. The high pressure suction device on the macrokeratome is designed to strangle the optic nerve and in ninety percent of patients, results in a retinal detachment. This is followed by an Extra Wide Extra Deep (EWED(tm)) ablation. The EWED(tm) ablation, which was developed by Dr. Butcher, is designed to puncture through the stromal bed and completely rupture the eye. The next step is the ablation. Blinded By The Light has developed an advanced military caliber laser and eye tracker that implements a GPS orbital satellite system. The laser is fired from the satellite and the cool, high-energy pulses which gently reshape the eye are controlled by an eye tracker with an accuracy of plus or minus three meters. After the ablation, the flap is immersed in a bed of steel shavings and fungal spores and then placed haphazardly back on the eye. Profuse irrigation with sulfuric acid is performed for at least sixty seconds. The patient is then deposited onto the surface of their driveway and is encouraged to stagger back into the comfort of their home. Before the Low Definition Vision (tm) procedure, which is always performed on both eyes, patients are advised to take megadoses of Vioxx. To keep costs under control post-op followup is handled strictly by email. If a patient has not committed suicide within six months of having LASIK at BBTLLC, then he or she is advised to stop taking anti-depressants. For those patients, a special in-home follow-up visit can be arranged with our consulting physician, Dr. Kevorkian. 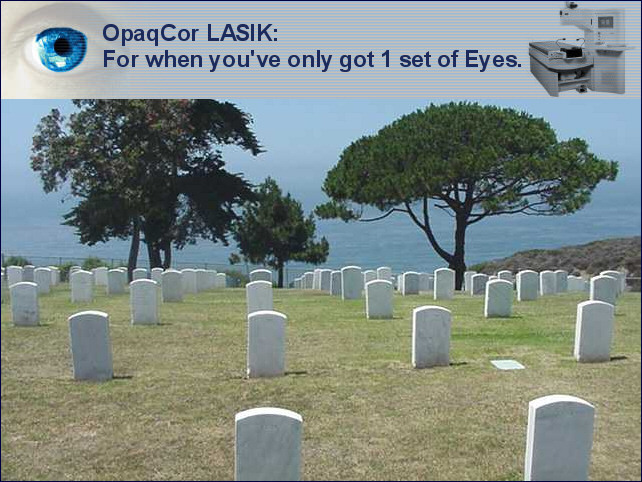 Disclaimer: Although Low Definition Vision (tm) and the OpaqCor(tm) procedure has yielded a ninety per cent success rate to date, a small percentage of patients may be left with some residual visual function. Less than ten per cent may be left with the ability to distinguish hand motion and less than one per cent may be able to count fingers. For those patients, Blinded By The Light offers free lifetime enhancements. At this time, the only form of payment accepted is cash in unmarked bills. Wire transfers to our numbered Swiss bank account may also be arranged. Informed consent forms will be provided as early as three months after surgery and can be mailed directly to the address of the patient's sanatorium or state mental hospital. White canes are not provided by BBTLLC, and before having Low Definition Vision (tm) LASIK, patients are encouraged to learn braille.